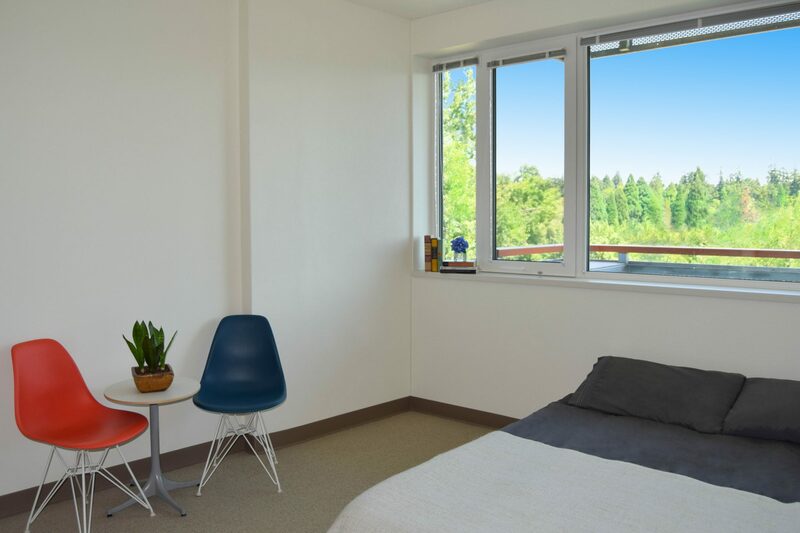 Built in 1966, Westmoreland’s Union Manor is a modernist concrete and glass structure in a park-like setting that includes a creek, community garden, and orchard. 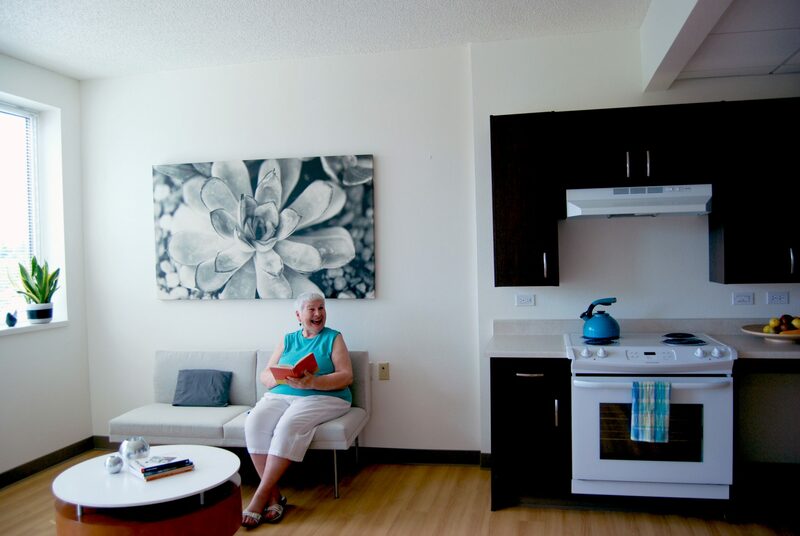 The 301-unit affordable apartment complex houses a vibrant community of seniors who value their independence and quality of life. 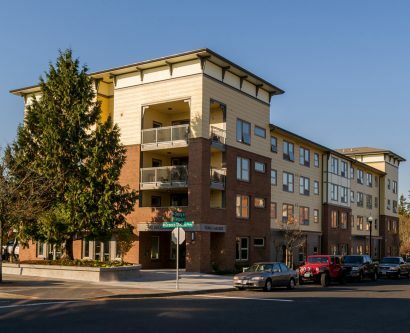 The renovation project included replacement of the exterior window wall on six floors, a new storefront system on the ground floor, seismic upgrades, replacement of water lines to the apartments, replacement of the HVAC systems, addition of insulation, a new roofing system, a stormwater management system, reconfiguration of existing units to make 18 of them ADA compliant, and the renovation of the resident balconies. 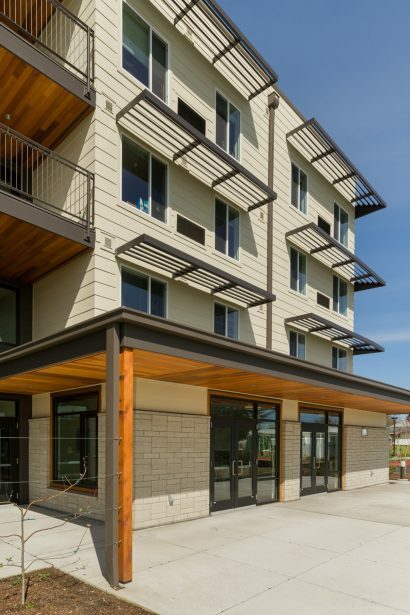 An under-performing building, the apartments needed a modern thermal envelope to reduce the load on the HVAC systems, as well as improve residents’ comfort and indoor air quality. 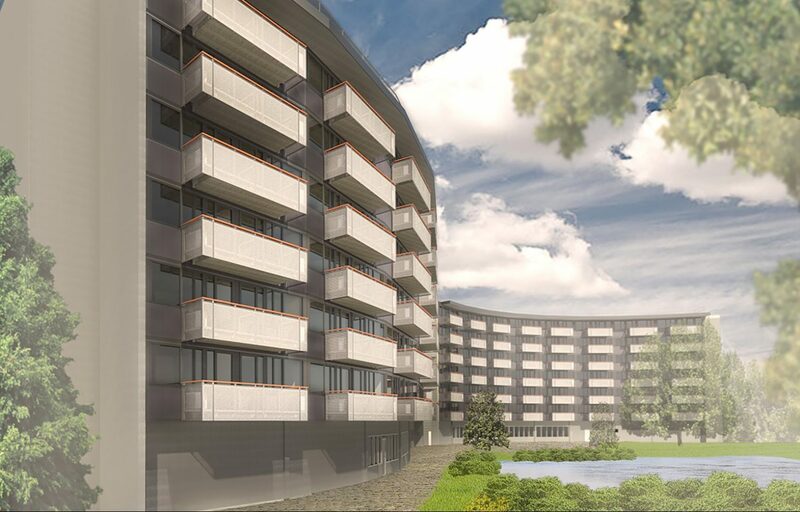 The owner also wanted to increase the building’s accessibility in order to accommodate residents. 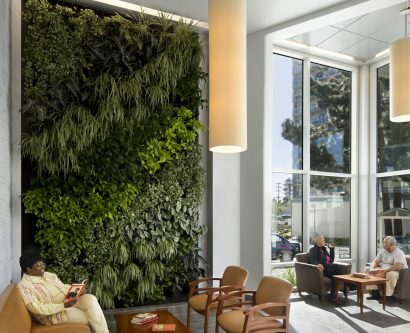 A number of measures were taken to improve the energy efficiency of the building which include new HVAC at the common areas and apartments, integration of triple-paned windows, new R-28 exterior wall system, and a new high efficiency hot water system. 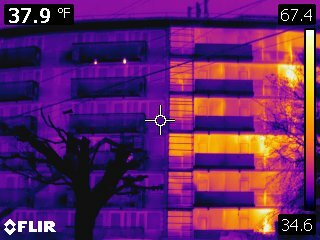 This FLIR image shows the normalization of temperature at the new window/wall system versus the original window/wall system. The energy conservation improvements are projected to equal an approximate 48% Total Energy Cost Savings for the building. 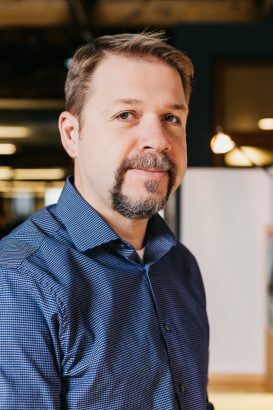 The remodeled lobby received new finishes, acoustic treatment, lighting, and a focal fireplace in addition to fresh new furniture and artwork. 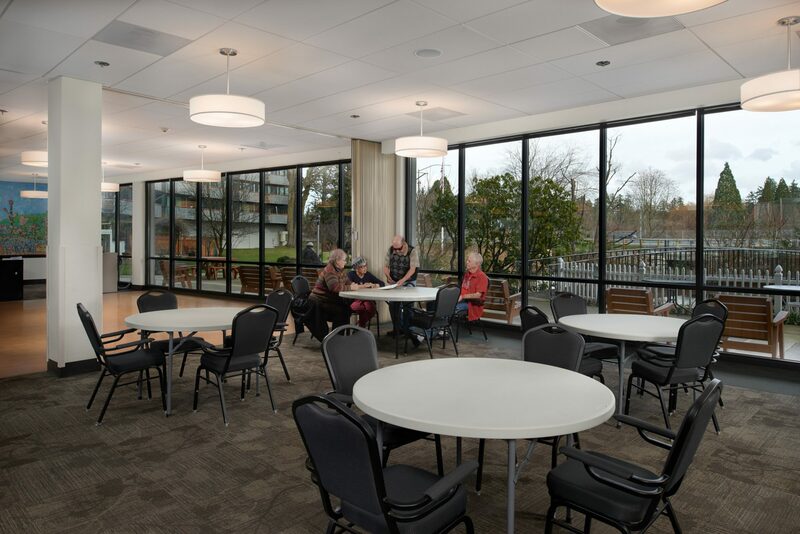 The multipurpose dining room has new flooring, a new acoustic ceiling with optimal reflectivity, lighting, and window treatments that reduce glare but maintain views to the community garden. 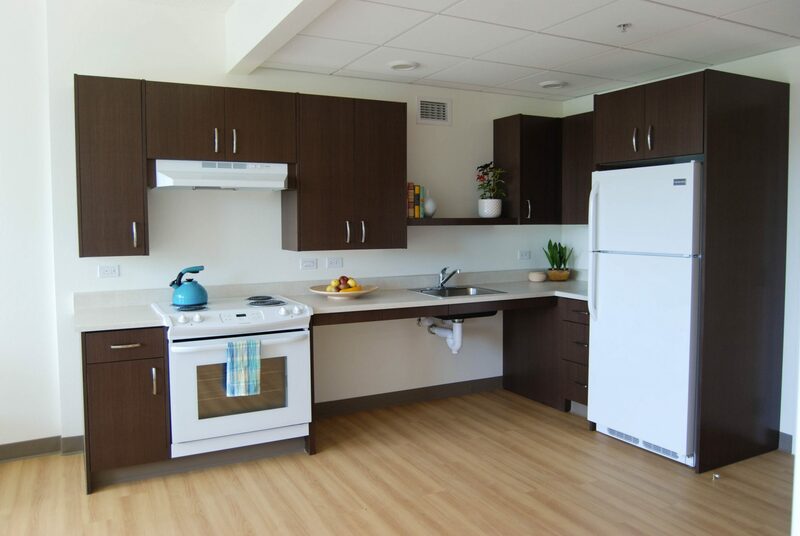 Kitchens were given a fresh look and reconfigured for enhanced accessibility. Large triple-pane thermal windows fill interior spaces with natural light while saving on heating costs.